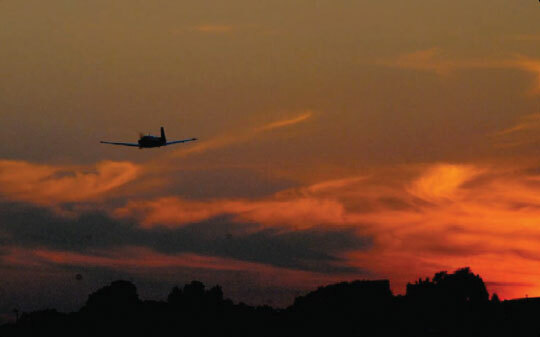 There are many good reasons to fly at night, but pilots must keep in mind that the risks of night flying are different than during the day and often times higher. [Figure 17-16] Pilots who are cautious and educated on night-flying techniques can mitigate those risks and become very comfortable and proficient in the task. It is estimated that once fully adapted to darkness, the rods are 10,000 times more sensitive to light than the cones, making them the primary receptors for night vision. Since the cones are concentrated near the fovea, the rods are also responsible for much of the peripheral vision. The concentration of cones in the fovea can make a night blind spot in the center of the field of vision. To see an object clearly at night, the pilot must expose the rods to the image. This can be done by looking 5° to 10° off center of the object to be seen. This can be tried in a dim light in a darkened room. When looking directly at the light, it dims or disappears altogether. When looking slightly off center, it becomes clearer and brighter. Figure 17-17. Night blind spot. Dark adaptation is the adjustment of the human eye to a dark environment. That adjustment takes longer depending on the amount of light in the environment that a person has just left. Moving from a bright room into a dark one takes longer than moving from a dim room and going into a dark one. While the cones adapt rapidly to changes in light intensities, the rods take much longer. Walking from bright sunlight into a dark movie theater is an example of this dark adaptation period experience. The rods can take approximately 30 minutes to fully adapt to darkness. A bright light, however, can completely destroy night adaptation, leaving night vision severely compromised while the adaptation process is repeated. Off-center viewing is another type of scan that pilots can use during night flying. It is a technique that requires an object be viewed by looking 10° above, below, or to either side of the object. [Figure 17-19] In this manner, the peripheral vision can maintain contact with an object. With off-center vision, the images of an object viewed longer than 2 to 3 seconds will disappear. This occurs because the rods reach a photochemical equilibrium that prevents any further response until the scene changes. This produces a potentially unsafe operating condition. To overcome this night vision limitation, pilots must be aware of the phenomenon and avoid viewing an object for longer than 2 or 3 seconds. The peripheral field of vision will continue to pick up the object when the eyes are shifted from one offcenter point to another. Several things can be done to help with the dark adaptation process and to keep the eyes adapted to darkness. Some of the steps pilots and flight crews can take to protect their night vision are described in the following paragraphs. If a night flight is scheduled, pilots and crew members should wear neutral density (N-15) sunglasses or equivalent filter lenses when exposed to bright sunlight. This precaution increases the rate of dark adaptation at night and improves night visual sensitivity. 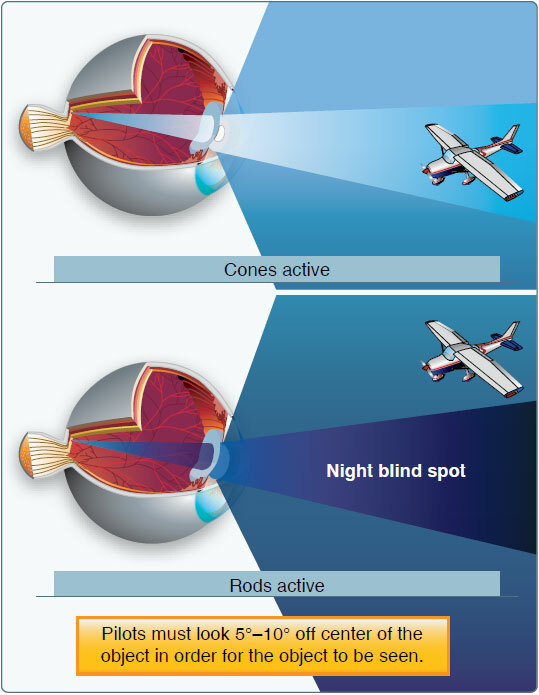 Unaided night vision depends on optimum function and sensitivity of the rods of the retina. Lack of oxygen to the rods (hypoxia) significantly reduces their sensitivity. Sharp clear vision (with the best being equal to 20–20 vision) requires significant oxygen especially at night. Without supplemental oxygen, an individual’s night vision declines measurably at pressure altitudes above 4,000 feet. As altitude increases, the available oxygen decreases, degrading night vision. Compounding the problem is fatigue, which minimizes physiological well being. Adding fatigue to high altitude exposure is a recipe for disaster. In fact, if flying at night at an altitude of 12,000 feet, the pilot may actually see elements of his or her normal vision missing or not in focus. Missing visual elements resemble the missing pixels in a digital image while unfocused vision is dim and washed out. For the pilot suffering the effects of hypoxic hypoxia, a simple descent to a lower altitude may not be sufficient to reestablish vision. For example, a climb from 8,000 feet to 12,000 feet for 30 minutes does not mean a descent to 8,000 feet will rectify the problem. Visual acuity may not be regained for over an hour. Thus, it is important to remember, altitude and fatigue have a profound effect on a pilot’s ability to see. 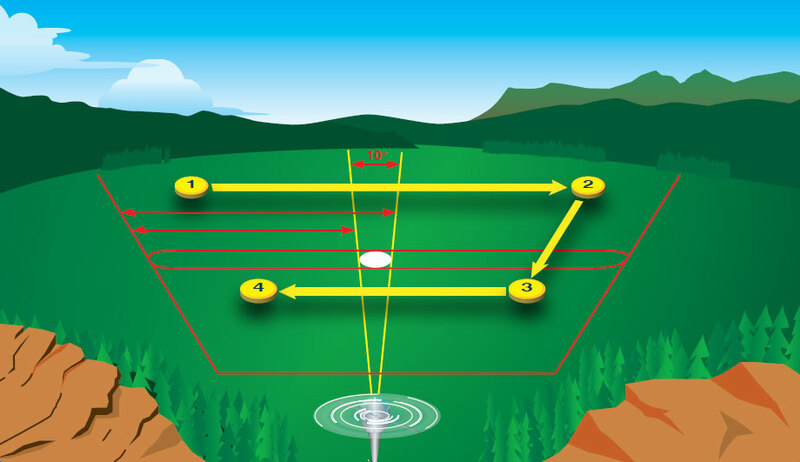 If, during the flight, any high intensity lighting areas are encountered, attempt to turn the aircraft away and fly in the periphery of the lighted area. This will not expose the eyes to such a large amount of light all at once. If possible, plan your route to avoid direct over flight of built-up, brightly lit areas. Flightdeck lighting should be kept as low as possible so that the light does not monopolize night vision. After reaching the desired flight altitude, pilots should allow time to adjust to the flight conditions. This includes readjustment of instrument lights and orientation to outside references. During the adjustment period, night vision should continue to improve until optimum night adaptation is achieved. When it is necessary to read maps, charts, and checklists, use a dim white light flashlight and avoid shining it in your or any other crewmember’s eyes.